B98 Academy III alumni and Del Norte HS class of 2017 Sean O’Callaghan is playing his college soccer at NCAA DIII Gallaudet University in Washington D.C. As a true freshman, Sean has earned the starting spot at center-back for the Bison. You are the manager of a competitive club soccer team full of players with dreams of landing roster spots on college soccer teams. Your team has been accepted into a college showcase, and everyone is excited. The team has prepared, you’ve been reminding your players to contact college coaches, the recruiting flyers are looking great, and it’s time for soccer! Most high-level showcases will have barricades on the sidelines that say “Players and coaches only.” Be sure you are clean-cut and wearing a hat or a shirt from your club so that you are seen as a team “official” when you walk past the barricades to give your flyers to college coaches. When interacting with a college coach, keep it short and sweet. The coaches are there to watch the game and usually do not want to carry on a conversation. A simple “Hi coach, here’s our recruiting info,” while you hand him/her the flyer is great. If a coach wants to talk more, you will be able to tell. Let the college coach dictate whether or not the conversation goes any further. He may want to know about a particular player. She may want to talk to your team’s coach after the game. He may want you to just hand over the flyer and go away. Every time you hand over a flyer to a college coach, make a note of it. Most college coaches will be wearing gear from their school, so identifying the college will be easy. Some coaches won’t be repping their school, so you’ll have to ask, “Which school are you from?” Have a pen & notepad handy so that you can keep a list, OR pull out your phone and text your co-manager the name of the college. I’ve used both methods, and the text list ended up being the best way of keeping the list. My co-manager also had a stack of flyers, and we would text each other during the game, keeping the list going and making sure we knew which coaches we had covered. At one game during the Surf College Showcase in 2016, we had over fifty college coaches watching! After each game, send out a quick email to the team with the list of colleges that were watching the game. You probably won’t get names of the individual coaches, but that’s OK. When a player emails a college coach, the email should be sent to everyone on the coaching staff anyway. Take a moment to talk with your team’s coach privately about the game and the recruiting. In person, at happy hour, or over the phone, whatever. Were there players that didn’t get to play when certain colleges were there? Did some coaches express extra interest in particular players? Talk about all of this with your coach so he/she can follow up accordingly. Remind your players to contact coaches of schools that interest them — SOON! College coaches have told me that they are inundated with emails and phone calls during the week leading up to a big showcase, but they don’t get a lot of emails during the actual showcase. This is a great opportunity for an email to stand out! If one of your players is interested in one of the schools that was watching a game, an email definitely should be sent that day (especially if that player did well in the game). 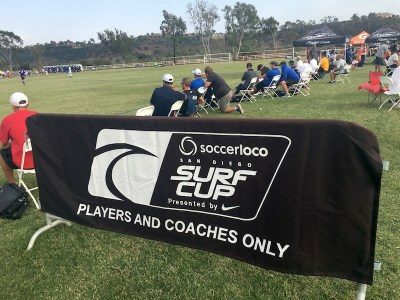 Ultimately, a player will earn his/her own spot on a college roster, but there is no doubt that a team’s support staff can be an enormous help in getting players exposed to college coaches during soccer showcases. Your team has been accepted into an amazing soccer showcase tournament. All of the players and parents are excited about playing in front of college coaches against great competition. You’ll be preparing yourself and your players in the days leading up to the showcase. 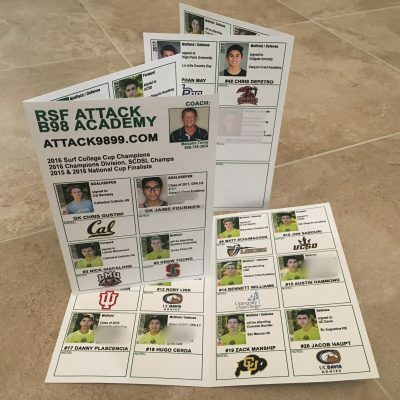 During the tournament, you’ll be patrolling the sidelines, handing out recruiting flyers to college coaches. 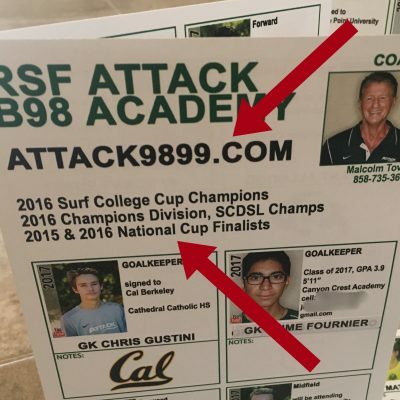 Will your team’s recruiting flyer help or hurt your team? I’ve been working on perfecting a team’s recruiting flyer for years now, and I believe I have finally developed the anatomy of the perfect recruiting flyer for soccer showcases. Dozens of NCAA coaches have complimented this design, and managers from other clubs have asked (very politely — you rock, Oceanside Breakers) if they could have one so they could replicate the layout. THICK MATTE PAPER! Use card stock with NO GLOSS. Coaches want to be able to write on the flyer with whatever pen they have handy. Glossy paper is from the devil. SINGLE FOLD! Tri-fold flyers look snazzy, but they’re confusing. It’s difficult for coaches to decipher any particular order of the info inside, and the flyers always end up folded incorrectly. Keep it simple with a single sheet of thick matte card stock with a single fold. COACH’S CELL PHONE front and center! Be sure to have a picture of your coach with his/her cell phone number prominently on the cover. NCAA rules prohibit college coaches from contacting high school players, but club coaches can be contacted. TEAM NAME, ACCOMPLISHMENTS, and WEBSITE front and center! Have your team’s name prominently at the top, along with the team’s best accomplishments. If your team has a recruiting website, include that link, too. Simple web addresses (URLs) are best. If you don’t have a team website, you can purchase a .com from GoDaddy and simply have it re-direct to your team’s GotSoccer page. OR, contact me if your club’s board would like to talk about making recruiting websites for all of your teams. EASY-TO-VIEW PHOTOS! Each player should have his/her own section with a photo. The photo should be recent, and head/shoulders only. 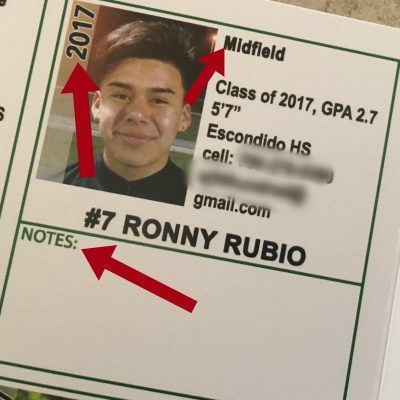 Since the actual photo on the paper will be quite small, crop the photo so that a college coach will be able to clearly see the face and match that with the player on the field. Teenagers will make this difficult, but try to have the photo match the player’s current hair style/color. EASY-TO-READ PLAYER INFO! Be sure to make the graduation year prominent for every player. Include the player’s name (duh), jersey number, grad year, position, height, email address, cell phone, high school, GPA, and possibly SAT/ACT test scores if the player wants that included. If a player is blazing fast (speed kills), include the 40yd dash time. NOTES SECTION! Be sure to leave room for college coaches to make notes. Each player should have space for notes, and you can leave more room for notes if your roster doesn’t fill up all of the room on the flyer. QUALITY PRINTING! They didn’t pay me to say this, I swear. If you’re local to San Diego, Print & Copy House in Encinitas is amazing. The turnaround time is great, and the quality is even better. DON’T TRY TO BE SNAZZY. A few years ago, I walked past a college coach trying to make sense of a recruiting flyer handed to him by another team. The flyer was eye-catching. It looked like something out of a marketing presentation from a hip start-up hoping for angel investor seed money. It was awful for college recruiting. Do your team a favor and leave the snazzy marketing material away from the recruiting flyer. If you use this layout, you can easily modify it to include 16-22 players by making more “notes” sections or increasing/decreasing the size of the team’s info section on the front. Memorial Day weekend is the traditional beginning of summer, and it is also the beginning of the summer recruiting season for college coaches. Teams have been working on their skills, looking to collect hardware for the trophy case as well as attract the attention of college coaches on the sidelines. Here is a team manager’s to-do list for the week leading up to a big summer showcase. Finalize your recruiting flyer and get it sent to the printer (read more about the perfect recruiting flyer HERE). Find the link to the list of college coaches attending the tournament. Each tournament will have the list online, like the ManCity Cup HERE. Email your players and families, telling them to look at the list of colleges and decide which college coaches they’d like to contact. Remind your players to be sending out emails to college coaches. Have an in-person meeting or a phone call with your team coach(es) to discuss the recruiting strategy at the games. The coaches will be busy coaching and will not be able to deal with college coaches during the games, but ask your team’s coaches if they want to be told if a certain college coach is there to see a certain player. Some coaches will be eager to put in particular players to be seen if a college coach is there to see that specific player. Other club coaches would rather focus on coaching the game. Make sure you are on the same page with your team’s coach! Remind your players to be calling college coaches as well. A phone call or voicemail will go a long way to help a player stand out to a college coach. College coaches are making their recruiting plans for the showcase right now. If a player takes the initiative and courage to call a coach and leave a nice voicemail, it could make the difference between being on an evaluation list or not. Pick up the recruiting flyers from the printer. Get a hat/shirt that has your club logo on it. Polo shirts are best, but whatever you can get is great. Get cash for parking at the fields. Also remind players and parents that you will be handing out recruiting flyers to college coaches during the games. Let them know that after each game you will send out a list of colleges that were watching. Let the families know that they can look forward to getting those lists from you (and that you like chocolate/beer/tacos, if they’re feeling grateful for all of your hard work). TOURNAMENT TIME! CLICK HERE to read all about recruiting during a showcase.